Rice paddies dispersed like faceted jewels form the terraced landscape beneath the summit of Mount Batur, an active volcano in north-east Bali. Their colours shift across the landscape as the growing season progresses. Green, yellow, silver, and brown patches seem to flow over the terraces as the rice is planted and harvested, and the paddies are flooded then drained. This multihued pattern is the result of religious practices that evolved over centuries on the island of Bali, the domain of the water temples that serve a water goddess who presides over a crater lake on Mount Batur. Through rituals performed by the priests of the water temples and the heads of subaks (community units), water is distributed throughout the landscape with enough to go around for all. The subaks of Bali have been resilient in the face of water shortages and pest outbreaks; they weathered the green revolution and its government-enforced agricultural practices. But researchers say this self-organizing system, which has managed to provide for a densely populated island for centuries, is now under threat. Stephen Lansing, a professor at Asian School of the Environment and director of the Complexity Institute at Nanyang Technological University in Singapore, has watched Bali change since his first visit in 1971. As an undergraduate student in physics, the island and its culture fascinated him so much he switched his field of study to anthropology. Noticing the impacts of new agricultural practices in the 1970s and 1980s led him to try to find the keys to successful water management and rice agriculture on the island. Lansing first documented the system in 1987.1 1. Lansing, J. S., 1987. “Balinese ‘Water Temples’ and the Management of Irrigation.” American Anthropologist 89:326-341. DOI: 10.1525/aa.1987.89.2.02a00030 See all references He mapped the rice terraces crawling up and down the slopes of Mount Batur, at the top of which the lake captures rainfall. Downstream from the crater lake, farmers began digging tunnels and canals 1,000 years ago to irrigate the rice paddies. Farmers who share a water source – generally a dam fed by an irrigation channel from the lake – form a community known as a subak: on average, a subak is made up of 80 farmers’ fields and covers about 40 hectares of land according to the team’s observations. Neighbouring subaks that share a common water source come together under a water temple. The organisation of the water temples and subaks downstream of the crater lake branch like a tree as the irrigation channels split. The jewel tones here represent different stages in rice cultivation. Illustration: Elsa Wikander/Azote. The supreme water temple of Bali sits on the rim of the crater lake at Mount Batur and serves the goddess of the waters, Dewi Danu. The goddess’s high priests collect holy water that they give to delegations from the regional water temples, who come every year bringing offerings of flowers and take part in ceremonies with music and prayer. The holy water that the delegates bring back is distributed to the local subaks. Each farmer receives a portion of the holy water that they sprinkle on their fields. 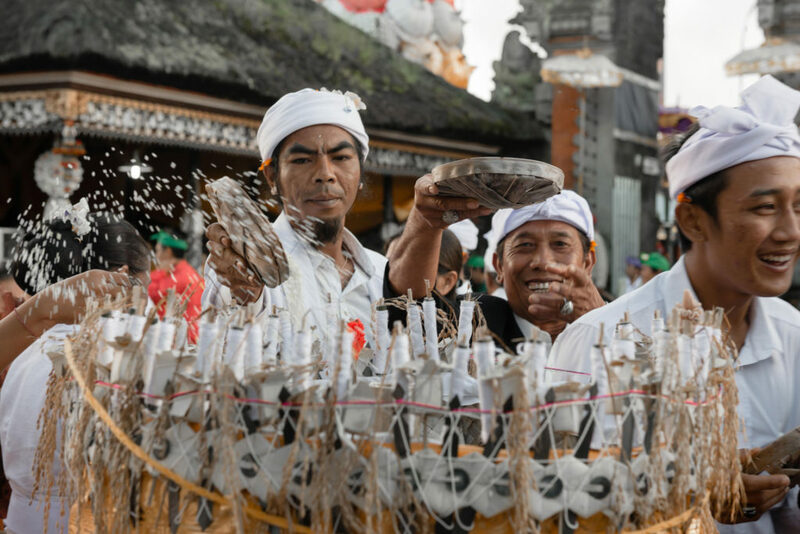 The timing of all of this is tied to the Balinese and lunar calendars, and sets the agenda for rice cultivation. Farmers meet during these ceremonies in the water temples to plan and set up a schedule for planting and harvesting, synchronising their irrigation needs within and across the subaks. Farmers in discussion at a subak meeting. During these meetings the caste system, otherwise prevalent in Balinese culture, is set aside so everyone’s voice can be heard. Photo copyright: Stephen Lansing. Lansing and James Kremer, professor of marine sciences at the University of Connecticut, created a computer model that linked up the farmers’ behaviour to see how the subaks might have evolved. The model makes it clear that when farmers can interact and learn from each other, for example, by copying their neighbours who got good yields, a pattern quickly emerges, says Lansing. And the cooperation continues at the next level up: if subaks rather than farmers manage the rice terraces in the computer model, the model subaks grow until they are about the same size as an actual subak in real life, covering the same number of hectares, Lansing says. “But it doesn’t stop there: the subaks then start to interact and the level of coordination becomes much wider,” he continues. Not only do neighbouring subaks coordinate their behaviour locally with each other, the coordination extends to even the most distant subaks. “This happens every time in the simulations,” he says. Lansing and his colleagues have tested the model against satellite imagery from Google Earth and found that the maps the model produces of the resulting “self-organizing” landscapes match the real world. Based on this they have created a computer code that can be used to identify similar systems elsewhere in the world. “By looking at patches in a landscape and how they are distributed in relation to one another in terms of type and size, we can learn a lot,” Lansing says. 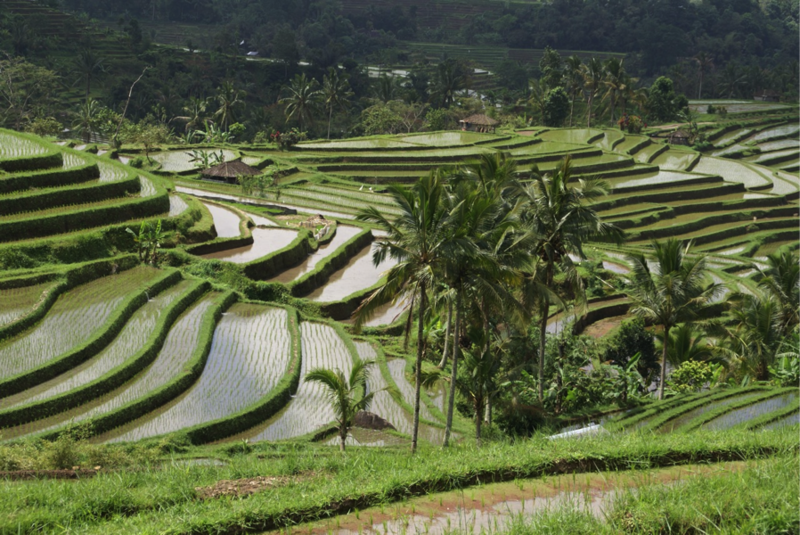 The model shows that the Balinese have managed their rice terraces in a way that every field is connected. “The pattern that emerges can help us say something about how much cooperation and what kind of management system has created the landscape that we see.” Lansing wants to make the code open source so that other people can use it to reveal similar systems elsewhere. But in real life, outside of computer models, synchronising agricultural practices in this way requires cooperation. While models can mimic the interconnections and resulting management schemes, they cannot show why such systems actually work. 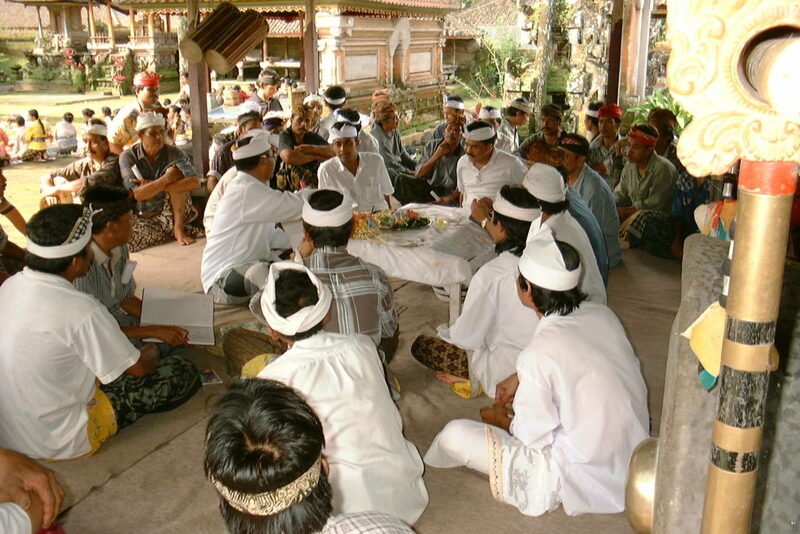 Lansing’s observations show that in the case of Bali cooperation hinges on people’s religious beliefs, their belief in each other, and their belief in nature. “The subak system really in a sense embodies the Balinese philosophy of Tri Hita Karana, the connection between the spiritual, human, and natural world. This sense of connection is deeply rooted in people and their culture and is the basis for daily life and societal development,” says Per Olsson of the Stockholm Resilience Centre, who also has done research in Bali. The management lessons from Bali’s water temples go hand in hand with the work of the late Elinor Ostrom, says Miriam Huitric, director of the Master’s programme at Stockholm Resilience Centre, where the case of the Balinese water temples has become an iconic teaching narrative. A Nobel laureate in economics, Ostrom challenged the concept of the “tragedy of the commons” introduced in 1968 by Garrett Hardin who argued that resources available to all – in the commons – are doomed to be overused by everyone. In the case of Bali, farmers closer to the main water source, the crater lake, could in theory increase their harvests by increasing their water use, having a negative effect on farmers downstream. So why don’t they? Because they worry about pests. If the upstream farmers leave enough water for the downstream farmers to flood their fields, that controls pests for everyone. Despite this seemingly perfect order, the past few decades have presented the subak system with a number of substantial challenges. In the late 1960s, the green revolution to increase productivity in agriculture reached South East Asia. Governments issued “technology packages” with new seed varieties, chemical fertilisers and pesticides, and farmers had to use them. In the early 1970s the green revolution reached Bali and the Indonesian government insisted farmers plant new varieties of “miracle rice” and instructed them to plant as many crops per year as they could. The water temple management system was phased out. The green revolution, a secular technology transfer initiative, papered over the important connection between religious ceremonies and agricultural practices, Lansing says. While the water temples were allowed to continue their rituals, they no longer guided how rice was cultivated. Rice yields initially became larger but it wasn’t long before problems started to appear. The new, more intense schedule for planting led to water shortages. Farmers downstream in the watershed started to notice that they couldn’t get enough water to flood their fields after harvest. The “miracle rice” also seemed to attract and sustain “miracle pests”, which could now also move freely between the fields as paddies were left unflooded. Despite farmers’ increased use of pesticides, the pests managed to survive, feasting on the rice crops. Pesticides weren’t the only chemicals added to the paddies. Farmers had long relied on the island’s nutrient-rich volcanic soil, capable of producing high yields without the addition of fertilisers. But the new agricultural mandates required that farmers use synthetic fertilisers, which weren’t taken up by the rice plants, as they already had all the nutrients necessary. Instead, the fertilisers flowed in runoff water downstream and into the ocean, causing problems for Bali’s nearshore coral reefs, which prefer nutrient-poor waters. The reefs started to die. Lansing argues that while the architects of the green revolution had the best intentions, in hindsight its methods were inappropriate for some of the real-world settings where they were applied, particularly in Bali. 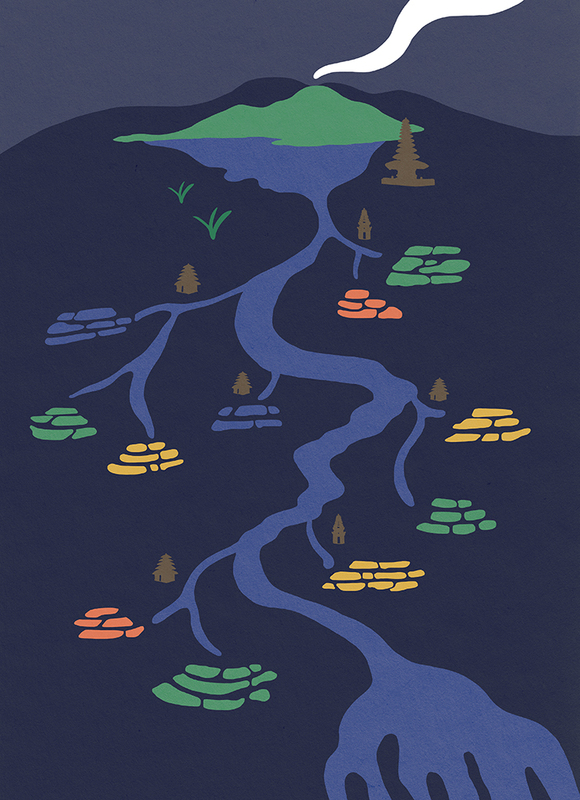 Top-down regulations failed to account for site-specific conditions for water and soil, and ignored practices and knowledge that had worked for over a millennium. The Indonesian government recognised the disconnect after nearly two decades. In 1988 it rescinded the orders to use specific seeds and chemicals, encouraging integrated pest management practices, and allowed farmers to return to their old practices. That meant allowing the water temples to manage the watershed once again. Today the subaks seem to have recovered from the green revolution, though farmers still use fertilisers and the subaks are not in complete control of the agricultural landscape. They now also face other challenges connected to globalisation, tourism, mismanagement of water, and loss of farmland, Huitric says. 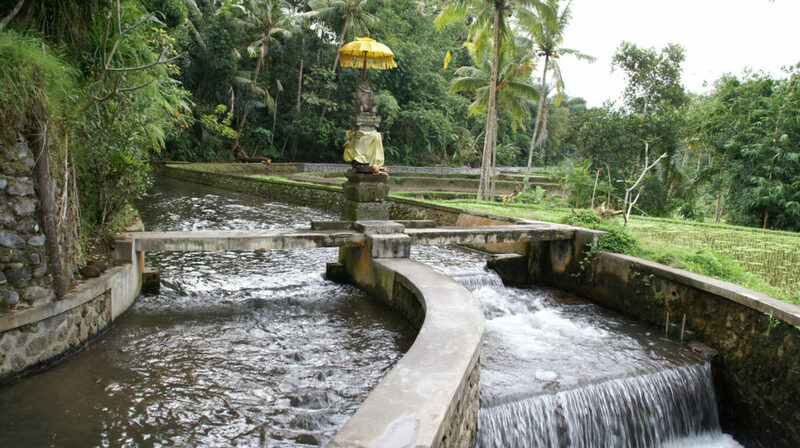 In 2012, the subaks were inscribed on the UNESCO world heritage list as a cultural landscape, in recognition of Bali’s unique water management system. In connection to the designation, complete control over the agricultural landscape was to be handed back over to the heads of the subaks, but this process is still ongoing. At the same time, the world heritage listing made the area even more attractive to developers looking to buy land and increase tourism to the island. This “land rush” has decimated the subaks, which currently lose about 1,000 hectares every year to development (a football pitch is a little less than 1 hectare). When housing or hotels rise in the middle of a subak, the fields risk becoming disconnected, throwing off the careful synchronisation of the subaks. Millions of visitors a year flood the island to capture images of its beautiful terraced landscapes, but those rice paddies might soon disappear. Nevertheless, Lansing remains hopeful. On Bali, the solution is clear, he says. “Let the subaks take over. Let them decide how to manage the land, what kind of tourism they want, and what kind of story they want to tell. It’s not like the Balinese need to learn how to manage things,” given their long history of managing the landscape in the past. This text is in the Creative Commons. Images are copyright as indicated in captions.